In this 2017-18 NHL season, Winnipeg Jets goalie Connor Hellebuyck burst onto the scene to steal the starting job in goal and cement himself as a top goaltender in the league. Hellebuyck broke into the league in the 2015-16 season, playing a number of games in relief of then-starter Ondrej Pavelec. It wasn’t until this year, however, that he proved he has the skill to be a solid starting goaltender and fill the spot the Jets have had missing for years. Connor Hellebuyck, the 6’4″, 207 lb. 24-year old from Commerce, Michigan, was drafted in the 5th-rd, 130th overall by the Winnipeg Jets in the 2012 NHL Entry Draft. 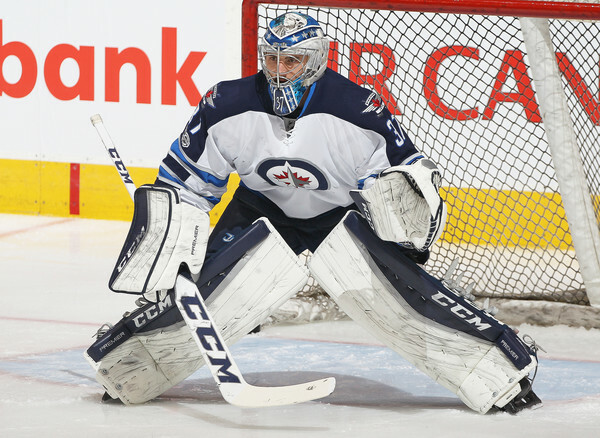 Before earning a chance between the pipes in Winnipeg in 2015, he spent his time at U. Mass-Lowell in the NCAA’s Hockey East, as well as in St. John’s and Manitoba with the Jets’ AHL affiliate. When he got a chance in the NHL, Hellebuyck immediately impressed, winning his first 3 starts, allowing 1 goal in each of those games. He would play 26 games that season, going 13-11-1, with a 2.34 GAA, .918 SV%, and 2 shutouts. That performance would usher him into the conversation for Winnipeg’s starting job in the season to come. In the 2016-17 season, Hellebuyck started a majority of the games, finishing with 56 GP, and a 26-19-4 record. He fell off a bit in regards to his numbers, posting a 2.89 GAA and .907 SV%, with 4 shutouts on the season. In another year where the Jets were part of the playoff conversation to commence the season, it was another disappointing outing by their goalies, Hellebuyck included, and provided no comfort to the fans, nor to General Manager Kevin Cheveldayoff. The Jets would look outward during the offseason, signing goaltender Steve Mason to a two-year, $8.2 million contract, a starting goaltender’s salary. It seemed as if they were going in a completely different direction this season, but that was anything but the case. To start the 2017-18 season, Steve Mason was between the pipes, seemingly holding the starting job. However, after a series of poor performances in the early going, Jets Head Coach Paul Maurice turned to the young Connor Hellebuyck to take the reins. Maurice didn’t regret the decision, with Hellebuyck running away with the position and never looking back. To conclude the regular season, Hellebuyck finished with 67 GP, posting a 44-11-9 record, setting the NHL single-season wins record among all American goalies, ever. He passed the likes of Mike Richter, Ryan Miller and Jonathan Quick (42, 41, 40). He also posted some of the best stats in the league, with a 2.36 GAA, .924 SV% and 6 shutouts. Finishing 2nd in the Central Division behind only the Nashville Predators, the Winnipeg Jets headed into the playoffs led by their goaltender, looking to make some noise. In the first-round, the Jets did just that, handling the veteran Minnesota Wild in convincing fashion, taking the best-of-seven series, 4 games-to-1. 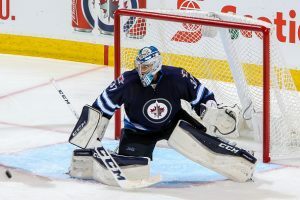 Heading into the second-round, Hellebuyck needed to be on the top of his game to start the series, as the Jets were matching up against the defending Western Conference Champion Nashville Predators. Hellebuyck has handled the pressure as well as anyone could hope, helping his team to a 2-1 series lead after a huge 7-4 win at home on Tuesday. In 8 GP in the playoffs so far, Hellebuyck is 6-2, with a 2.36 GAA and .920 SV%, with 2 shutouts. Now with the upper hand, and another game at home on Thursday with a chance to take a stranglehold on the series, Hellebuyck and the Jets are in good position to continue their impressive run this season. Mirroring his impressive performance in the 2014 World Hockey Championships, Connor Hellebuyck is again proving his worth in a high-stakes situation. He has more than earned his role as the starting goaltender for the Winnipeg Jets, and looks to take them as far as he can this year. In years to come, Hellebuyck is slated to be one of the league’s best goalies, and is giving no reason to the fans nor his coaches and managers to doubt him moving forward.